This month's NewBeauty TestTube is a special addition with products exclusively from the brand It's A 10. This is the first TestTube I've gotten that centered around one particular brand and honestly, I love the idea! Not only are there full size products included, but the selection gives you a well-rounded idea of what the company has to offer. Let's take a look at this month's Ultimate Guide to Beautiful Hair. Miracle Whipped Shampoo | $25 | This sulfate-free shampoo is a fantastic multi-tasker. It provides hydration, strength and shine. You can use this shampoo even if your hair is color-treated. I haven't dyed my hair in a while, but I love that if I do, I've got a shampoo to protect it. As with all the products included this month, it smells amazing too! Miracle Defrizzing Gel | $17 | This gel can protect hair against frizz whether you have wavy or straight hair. That's a big bonus for me because I go between those styles in different seasons. The formula isn't sticky and hydrates hair to help reduce breakage. This sounds like a great addition to my haircare routine for fall and winter! Miracle Whipped Styling Balm | $25 | If gel isn't your thing, you might just love this styling balm. Not only will it help with frizz and resist humidity, but it also helps prolong your style. You'll also get protection from fading if your hair is color treated. One of my favorite benefits is the added, volume, I can never have enough! Potion 10 Miracle Styling Potion | ~$7 | If you're a fan of heat-styling, this one is for you! With just one use this styling potion will reduce the look of damage and keep hair silky smooth. It provides hydration, frizz protection, and can be used on wet or dry hair depending on your style. This would be a great pick for travel! Miracle Leave-In Product | $9 | This leave-in treatment is probably the first product many people think of when they hear "It's A 10." 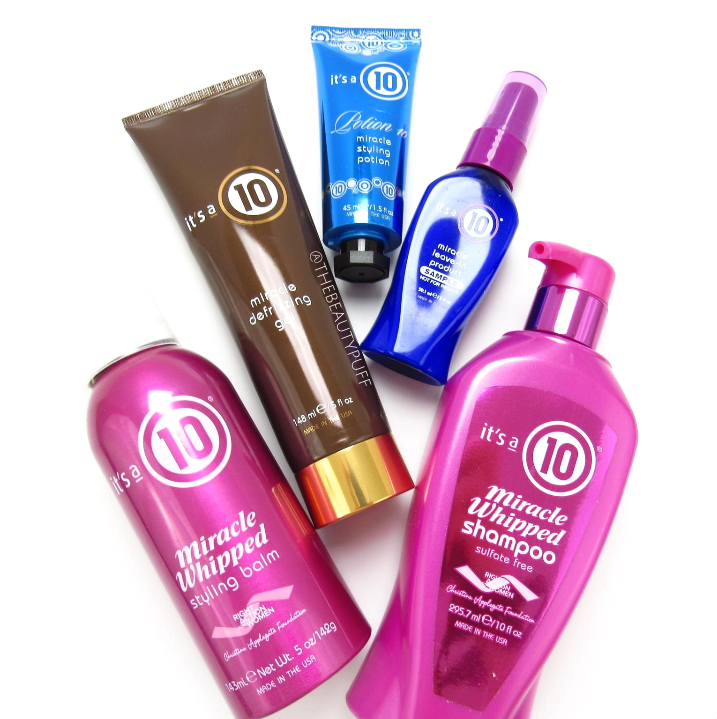 Need a little shine, volume or frizz protection? It's all in this handy spray bottle you can easily travel with or keep in your purse. You can use it before you style your hair as well as to freshen your look between washes. Miracle Shampoo, Conditioner & Hair Mask | $12 ea | For your everyday haircare routine, quality shampoo and conditioner are a must. This duo leaves hair silky smooth, protected and ready for heat styling. If you're in need of some deep-conditioning, the hair mask is great to have on hand. It nourishes hair with apricot kernel oil, sweet almond oil and linseed extract. You can use this treatment weekly and it only needs to stay in for a few minutes so it's an easy step to give your hair some TLC this fall and winter. I love the changes NewBeauty is making to their TestTube! Excited to see more? Subscribe below!